Cross-body shoulder bags have replaced the clutch. 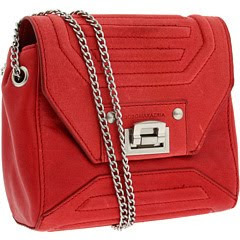 This BCBG bag has double chain detail and cool stitching on the leather. I love it in red, but the mustard also pops. At 6pm for only $60! Oh, the Chinese (and their government)!